sb.append("\nPhone Number:--- " + phNumber + " \nCall Type:--- "
Thanks and your welcome Yamini! Hello manish, I always read your blog it is very helpful to me and others who want learn android. you always reply all off your visitors questions i like it.really you have good knowledge in your domain, you are my role model, i want be like you.i want talk with you can i have your phone number please? if you don't mind. Thanks! Thanks! Thanks ! Thanks! Thanks! Actually i am working on face deduct application and i am facing some trouble. can you please help me? i want discuss my problem with you. So you can save it into ArrayList and display it in listview. you should create custom adapter and arraylist like. And please mind it in below version of devices you can't get Contact Image. what error? can you share please? No worry its only because of depriciate method. Just search for another option on google or leave it as it is. It will work with out issue. hii sir..am following your blog.. thank u so much..and how to get specific contact call history.. I have not check it may be syntax error in code but logic is only this. so please check and modify. Is it also work for android version 4.2?? i am getting error while running on emulator "unfortunately callhistory is stopped"
Your emulator have phone contact? If yes sure it should work..
thank you sir, but i m unable to get the output. i installed the app on my android phone it asked for permission of reading the contacts and it got installed successfully. Still when i m opening it i m only getting a blank page. hello sir, still the problem is not solved i wrote the code again but i m getting an error "unfortunately, callhistory has stopped. " both on phone as well as emulator. please help to sort it out. is read contacts permission in your manifest? may be it will work for you..
thank you so much sir. :) . its working fine with this permission android:name="android.permission.READ_CALL_LOG". well on some device it is working without any permission :) but i don't know why ..
sir can you please help me with two more codes??? if i have any demo code or any link sure i will provide. 1) yes you can get all send/receive messages list, if you need code please share your email-id. 2)getting facebook and whatsapp activity some tricky, i have never try it. you should use their APIs. Well in my phone it is working without Call_Log permission like we don't need to give camera permission. Nice tutorial and i just want to ask is it possible to use this coding for charge log instead of call log? if not can you please teach me how to do it...i searched everywhere to find the coding for charge log but still it is hopeless. Charge log means? Battery charging status? or you want know about call charges when you make call to someone? if yes then it is not possible. It is possible only by your network service provider. Yes, it is for battery charging status, the data which is the time, date, level and status will be recorded each time the USB connected to the phone for charging. Do you have any idea on how to do it? thanks Manish. I just did what you explain here, but when i run my program it warns that the project unfortunately stopped. can you help me what am i supposed to do? thank you very much Manish. Do you know how i can get the missed call duration in milliseconds? In my knowledge you can get the time of miss call but duration of missed call is tough. Sorry no idea. is there any difference in 4.4? I think you should use Asynck task and it will work..
hi manish, I want code for how to import this call log to my sd card as an xml file and is it possible to include call cost?can you please share the code. Main Thread issue may be here. So try to get call history inside AsYnc task. Its really nice and informative tutorial for us. But I am having 1 query regarding the Call logs, this code works fine with single sim devices but its not working properly in case of dual sim. So can you please kindly guide on this that how can we get logs for dual sim. If the api can't do that then how can we find work around because phones like Micromax, Moto g which are dual sim devices are having in built call logs and they are providing these information correctly so that is absolutely possible but I don't know how to go ahead with that. So it would be really great if you can help me in that. By default it will work for sim-1. So if you need for both you need to do some code. How can i create my own missed call list.plz help me as soon as.thnks in advance. Own means? This is all call record list, you can put/use it any where. I am following you and your blogs are really extraordinary and so helpful to us. Sir, can you please provide the demo application/code for the same? This will be very helpful to me. Please copy paste form above as it is not much big code..
your blog really he;ping me a lot thank you,i am trying to develop an application for birthday remainder with the existing birthday data with data. can you please suggest me some code or something. Do you think its a problem related with some import? I Only get Last Missed Call on Text-View so what can i do.???? I want only Outgoing Call details. That as to detect after each call. It should be automatic, no need of user interaction. It is possible to fetch the detail after each call.? Had you added permission in your manifest? but in case of missed call it give duration more then 0 in some devices only. Can you please send a code to read call log after every call automatic an save automatic. Actually sir i am reading whole call log and show like you are showing but the problem is that if call type is missed call in call log that time duration should be 0 but it give be more than 0 what should i do? since managedquery is deprecated can you please provide the upated version of this example.? How to get call log for particular sim in Dual Sim device? I think above code provide us call history from our phone, no matter from which SIM you get that. I am not sure how can you do this, please Google and let me know if you find anything. I don't think so, because its get your phone call history and if there is no history how can you get the record from phone database. how get missedcall(or sms) per cantact ? You will get all data from URI and then use if condition before switch condition and if it match to a given number then only write the log. i used this int owner = managedCursor.getColumnIndex(CallLog.Calls.PHONE_ACCOUNT_COMPONENT_NAME); for getting the phone account component name used to place the call. then, I add it in the string builder along with other fields. what is the error? have you given permission into manifest? Can't say anything without debug the app. But please check your 100 contacts have phone number. And scrollview is able to scroll till 100 contacts, may be it is scrollview issue. Do one thing put your record into Listview instead of StringBuilder and see if it work. When you get all log just write them into sd-card. it is not working... It shows an error.Please help me!!!!! Hi, thanks for your tutorial. In my application, I need to list call logs for a particular contact. I tried your method (compare phone number) but it is not very optimized and contact number and call log number are not always with same format. Any idea to do better ? I think you can use String compare like if number.contains(95999999) someting like that. I Want to get Contact Name . from your code i can get only the contact number, not contact name . From call history you can't get the contact name. For this you can do one thing compare the number from contact database and return the name. Do you think logically it is possible? Well answer is no. Without help of service provider you can't get the call cost. I have a Android app project . Drop me a test email at manishupacc@gmail.com with your contact number. 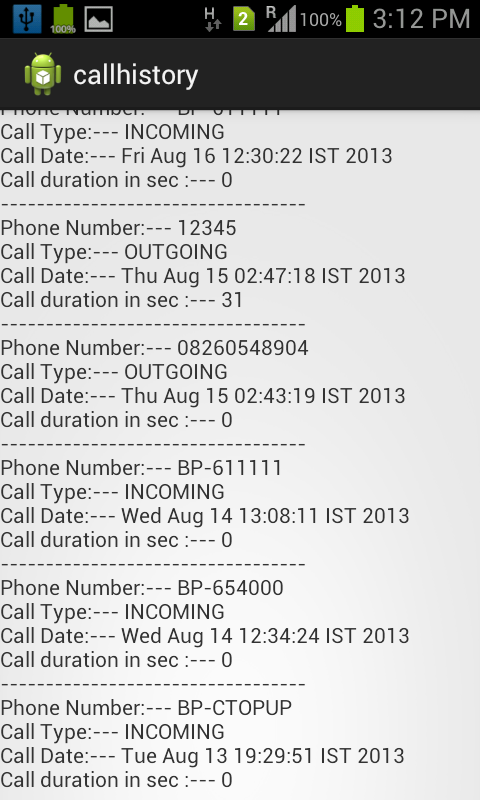 Hello Sir... Is it possible to fetch the contact name like we get in phone call log rather than using CACHED_NAME. i want only last week calls insted of total log how can i do it?